PNNT reports results later this week and this update was previously provided to subscribers of Premium Reports along with target prices, dividend coverage and risk profile rankings, credit issues, earnings/dividend projections, etc. On November 5, 2018, Matlin & Partners Acquisition Corporation (NASDAQ: MPAC, MPACU, MPACW), announced that shareholders have approved MPAC’s merger with U.S. Well Services, (“USWS”). PNNT’s loans will be refinanced and its equity position will be publicly traded. PNNT is a component in the ‘Recommended Higher Yield’ portfolio due to its current yield of 10.1%, higher quality management, stable dividend, and trading over 5% below its short-term target price. As predicted, PNNT has been actively repurchase shares including almost 1.1 million (1.5% of outstanding shares) from May 1, through June 30, at a 19.2% discount to its previous NAV. NAV per share increased by 1.0% (from $9.00 to $9.09) partially due to accretive share repurchases and net realized/unrealized gains of over $5.1 million. More importantly, the company continues to deliver net “realized” gains from exiting investments including $17.4 million during the recent quarter and a total of $43.0 million over the last three quarters. Continued accretive share repurchases should improve earnings/NII per share along with portfolio growth and use of leverage as well as monetizing (selling and reinvesting) its equity investments that could result in a dividend increase at some point. There were no investments on non-accrual as of June 30, 2018, and energy, oil & gas remains around 14% of the portfolio. On September 07, 2018, PNNT declared a distribution of $0.18 per share, paid on October 2, 2018 and the company has approximately $0.26 per share of taxable spillover income and gains and I believe that the current dividend is sustainable after taking into account the new fee structure as shown in the Leverage Analysis. For the quarter ended June 30, 2018, PNNT reported just above my base case projections and was not expected to cover its dividend due to the previous quarter with “larger-than-expected decline in portfolio investments driving a historical low regulatory debt-to-equity of 0.46”. However, the company covered 92% of its dividend during the recent quarter and has covered by an average of 111% over the last 6 quarters. As predicted, there was another decline in the overall portfolio yield from 11.5% to 11.4% as the company invests in safer assets at lower yields including the most recent investments at an average yield of 10.5%. 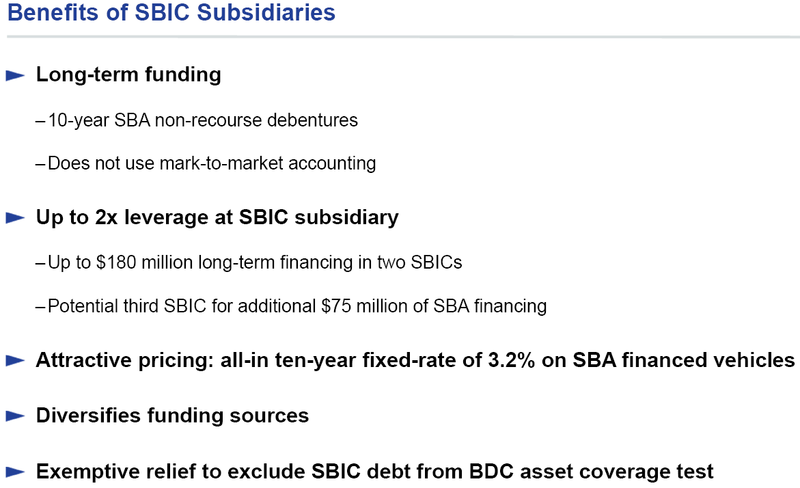 The company has significant borrowing capacity due to its SBA leverage at 10-year fixed rates (current average of 3.2%) that are excluded from typical BDC leverage ratios. Management was recently asked increasing leverage through reducing its required asset coverage ratio and mentioned that they would like “to maintain our investment-grade ratings”. As discussed in previous reports, I am expecting minimal portfolio growth as the company is keeping a conservative leverage policy of GAAP leverage (includes SBA debentures) near 0.80 until it can rotate the portfolio into safer assets. 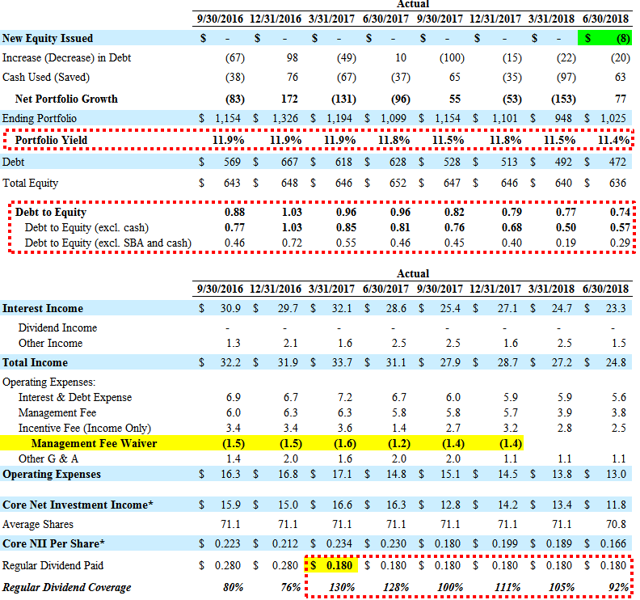 However, as mentioned earlier, the company has over $107 million in cash for debt-to-equity ratio of 0.57 after excluding cash, implying that there is available capital for share repurchases and portfolio growth over the coming quarters. Management is focused on maintaining its net interest margin and dividend coverage, even as its portfolio yield continues to decline, through selling most of its equity positions and rotating into income producing investments and reduced borrowing rates by redeeming its 6.25% Baby Bond. For the quarter ended June 30, 2018, net asset value (“NAV”) per share increased by 1.0% (from $9.00 to $9.09) partially due to the previously discussed accretive share repurchases and net realized/unrealized gains of over $5.1 million. More importantly, the company continues to deliver net “realized” gains from exiting investments including $17.4 million during the recent quarter and a total of $43.0 million over the last three quarters. Total direct exposure to oil and energy-related investments account for around $137 million or 13.4% of the portfolio fair value. The company will likely use higher leverage in the coming quarters and continue to increase the amount of first-lien positions that recently increased from 40% to 43% of the portfolio. 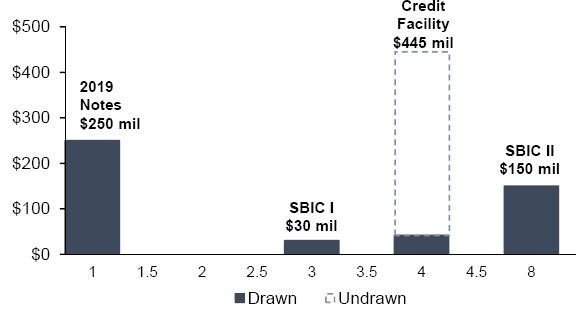 Also, as shown in the table below, the company has reduced the amount of subordinated debt from $121 million to $34 million, or from 10% to 3% of the portfolio, over the last three quarters.